A while ago, the HERCULES project was endorsed by the ICSU/UNESCO-Programme on Ecosystem Change and Society (PECS) a global initiative to strengthen place-based, long-term social–ecological case studies. As a contribution to a special issue on PECS in “Ecology & Society”, the HERCULES partners have reflected on the contributions of cultural landscape research to the study of ecosystem change and society. (1) The particular strength of a cultural landscape perspective is that it considers humans as integral elements of landscapes, whereas other models tend to see humans as impartial observers, external drivers of ecosystems, or mere beneficiaries of ecosystem services. Landscape research can thus identify options for recoupling social and ecological subsystems, both at the practitioner and policy levels. (2) Recent advances in quantifying and mapping landscape structure and land-use intensity have been driven by improved availability, processing, and analysis options of large and consistent sets of high-resolution spatial data. They have the potential for the study of ecosystem change, because they enable fine-grained, but large-scale quantification of ecosystem change processes. By this, they may bring big data-driven global-scale and presumably descriptive place-based research together, allowing for enhanced insight into the nested multiscale dynamics of social-ecological systems. (3) Consideration of long-term landscape history in the study of ecosystem change and society is important, because the capacity of an ecosystem to provide services and the realization and recognition of key ecosystem services through society evolve over time, with some ecosystem services waning, others being persistent, and others having been discovered only recently. Therefore, awareness of historical variation is a basis for accurately projecting ecosystem services into the future. Landscape history can provide tools, theories, and methods that allow such integration of an historical perspective into ecosystem studies. (4) Frameworks, methods, and modeling tools for assessing drivers, processes, and actors of landscape change are relevant for ecosystem change and society, allowing analysis of the in-depth dynamics of local and regional social-ecological systems. In particular, they may facilitate better understanding of the largely unexplored feedbacks between distant places. Knowledge of the actors in landscapes is also a precondition for sketching future landscape developments, especially for accommodating new land uses, e.g., wind turbines or photovoltaic plants, in landscapes. (5) Categories and frameworks of ecosystem services have been made by experts, but people may have different understandings of a landscape’s contributions to their well-being. Landscape research points to the social complexities of ecosystem services, especially to the visible and invisible conflicts around them. Surveys and stakeholder consultations can be used to generate place-based understanding of landscape values, supplemented by detailed spatial data of landscape changes and values. By this, research can address the various, stakeholder-specific and often contested, views on landscape values and the ways in which policies are affecting local landscape evolution. (6) The emerging issue of landscape stewardship shows principles that are informative for the study of ecosystem change and society. Landscape stewardship as a normative concept rivets onto the simultaneous improvement of food production, biodiversity or ecosystem conservation, cultural heritage preservation, and human well-being, rather than on the maximized production of an individual ecosystem good or service. Landscape stewardship can offer lessons in self-organization of communities and stakeholder participation, including people not only as variables affecting landscapes but also as stewards of those landscapes, supporting adaptive, collaborative management within a social learning framework. 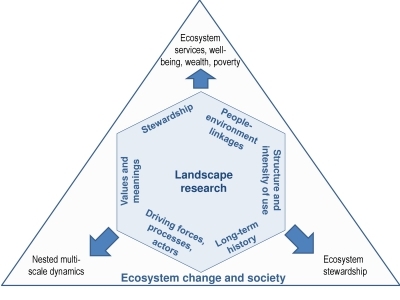 In our conclusions, we suggest that landscape research and studies of ecosystem change and society are complementary, and bidirectional exchange between them has the potential to create a truly integrated social-ecological perspective on ecosystems and landscapes. The full paper can be downloaded here: http://dx.doi.org/10.5751/ES-07443-200205.